ScanPartner is equipped with straight path paper feeding mechanism for reliable scanning and high precision separation mechanism using brake rollers. This means ScanPartner is able to scan a wide range of documents including non-standard documents, such as thin documents (41g/m2 or above) and plastic cards (up to 1.4mm in thickness). Using the flatbed of SP30F, bound books or pamphlets can be scanned easily. 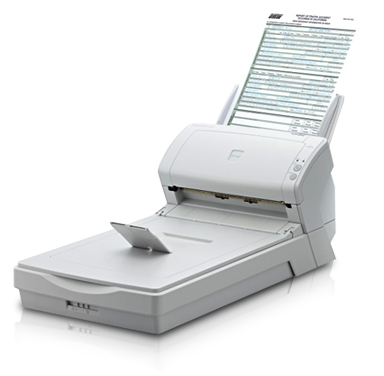 The ScanPartner SP30F is able to scan A4 documents at an impressive 30ppm (color, duplex, 200/300dpi). To further improve work efficiency, it is also armed with ultrasonic sensor to detect multi-feed to ensure reliable scanning even when scanning large volume or mixed batch of documents. The ScanPartner is equipped with automated functions such as auto size recognition and blank page removal to simplify scanning operations and pre-scan sorting. In addition, the image can be automatically converted into B & W image which is optimized OCR (Optical Character Recognition). To this end, the scanner can be integrated with a wide range of applications that fits any usage scenario. Presto!™ PageManager™ – Image data management/editing application developed by NewSoft Technology Corp. This software allows user to save image data in various format and add password to the PDF file for managing and editing scanned data easily. ABBYY™ FineReader™ Sprint – OCR application developed by ABBYY Software Ltd. This software can convert scanned images into text documents, such as searchable PDF or Microsoft® Word file to be utilized for other work tasks. The scanner can be integrated with a wide range of applications that fits any usage scenario. PaperStream IP is equipped with industry’s standard, TWAIN/ISIS™, to help to integrate various user’s applications for efficient scanning. 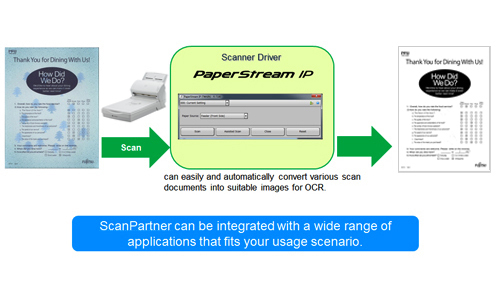 The ScanPartner comes with “Scanner Control SDK for ScanPartner” to allow users to scan easily using own work system/application. SDK can be integrated to a wide range of work system/applications to fit user’s demand. and only supports 127 g/m2 to 209 g/m2 (34 lb to 56.2 lb) for A8 size.